Lanvin will launch Jeanne Lanvin Couture Birdie, a new limited edition fragrance for women. Jeanne Lanvin Couture Birdie is a flanker to 2012's Jeanne Lanvin Couture, which was a flanker to 2008's Jeanne Lanvin. 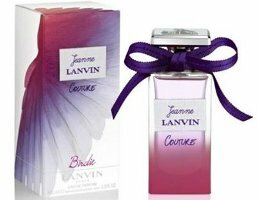 Jeanne Lanvin Couture Birdie is a fruity floral; the notes include raspberry, violet leaves, litchi, peony, plum, magnolia, cedar, vanilla and musk. Lanvin Jeanne Lanvin Couture Birdie will be available in 100 ml Eau de Parfum. Birdie is a new word for sure! It is odd. Perhaps it has some couture-linked meaning I’m not aware of. Makes for a pretty box design though! Is it a flip-top box? Birdie? Lol..what in the world, Tweety was behind this. Sufferin succotash..that name is bad. I glanced quickly at the bottle and thought it said conure. My conure and I were shocked for a moment that they would carry the bird theme that far but alas, it says couture. Must get those reading glasses I guess.